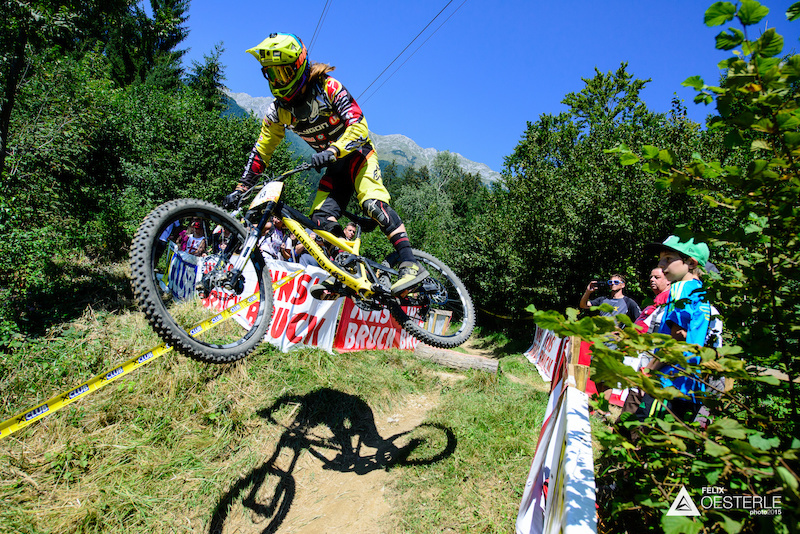 Marcelo Gutierrez repeats his victory at the Nordkette Downhill.PRO 2015, on Sunday August 29. 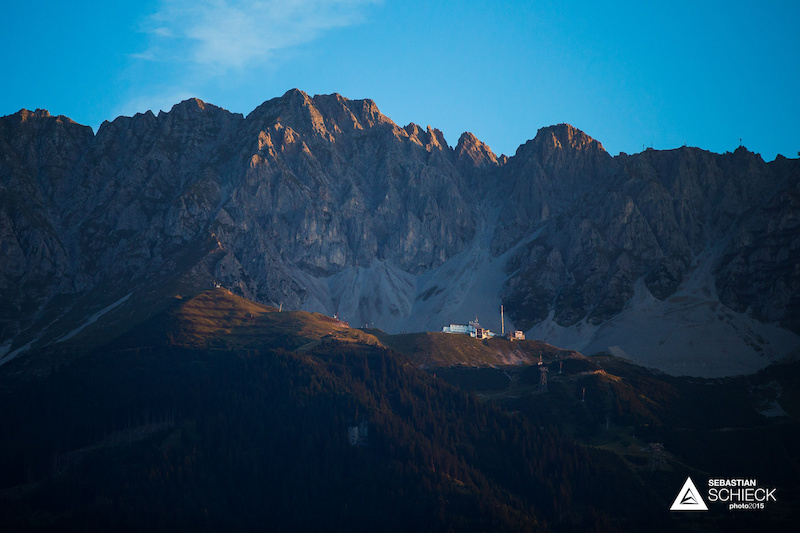 Extreme heat and an endurance test – the 4.2 km long distance race off Innsbrucks Seegrube with a vertical drop of more than 1000m, still takes no prisoners in 2015. 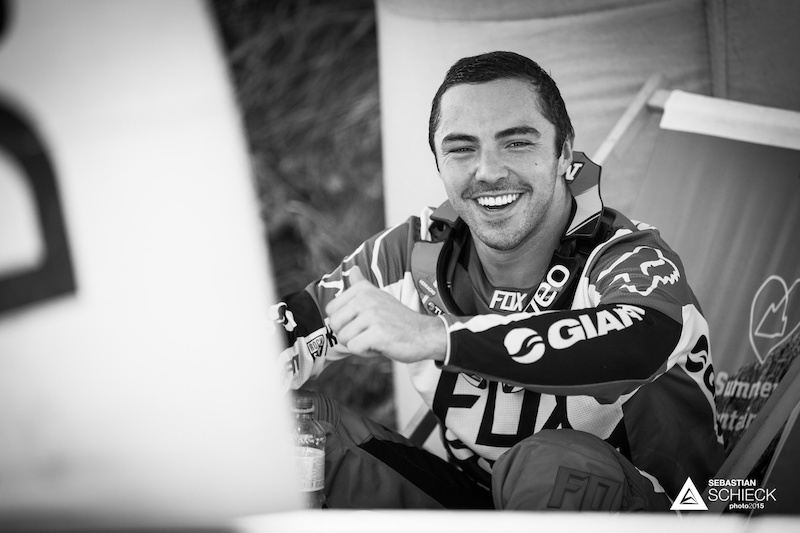 After exhausting 9:45.88min Colombia’s Gutierrez flys across the final jump and takes the win again after 2014. 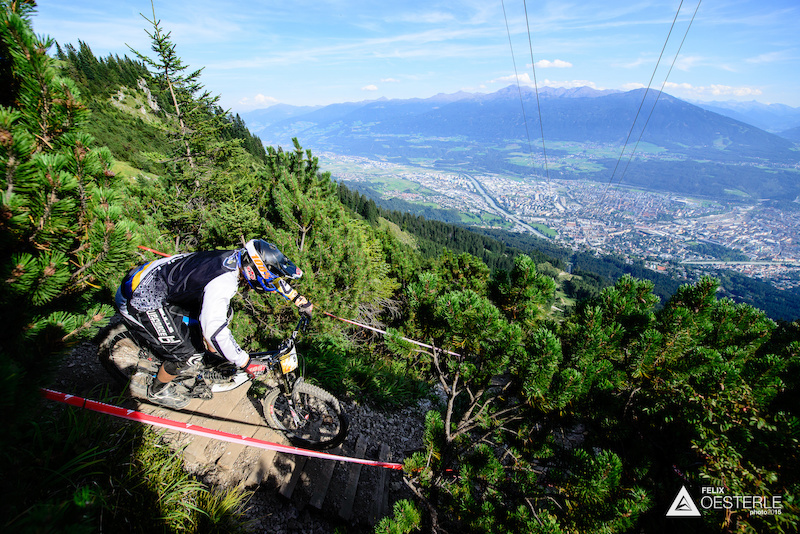 Almost 20 seconds behind and in second place is pro-rider Wyn Masters of New Zealand (10:05.46), ahead of the first Austrian in third place. 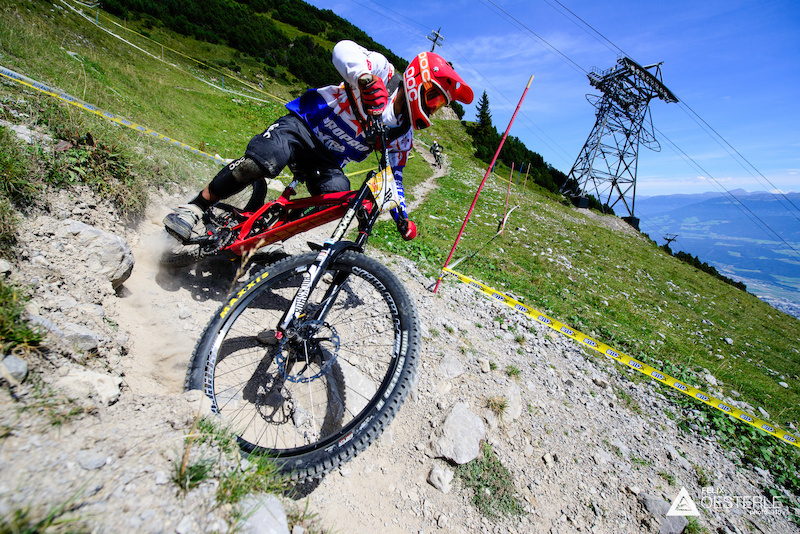 David Trummer (10:09.31) not just made the podium, but also crowned himself Austrian Downhill National Champion 2015. 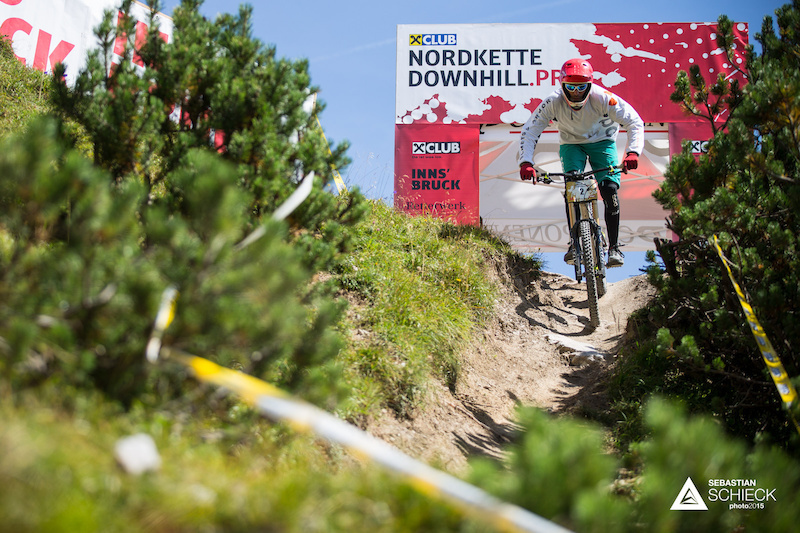 Have a look at the review of Nordkette Downhill.PRO! Enjoy! 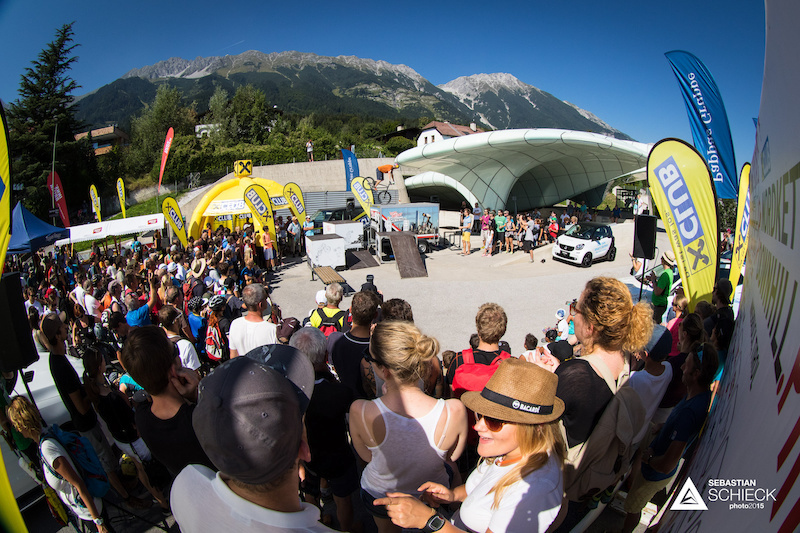 On August 29th, Innsbruck hosted the Nordkette Downhill.PRO 2015. 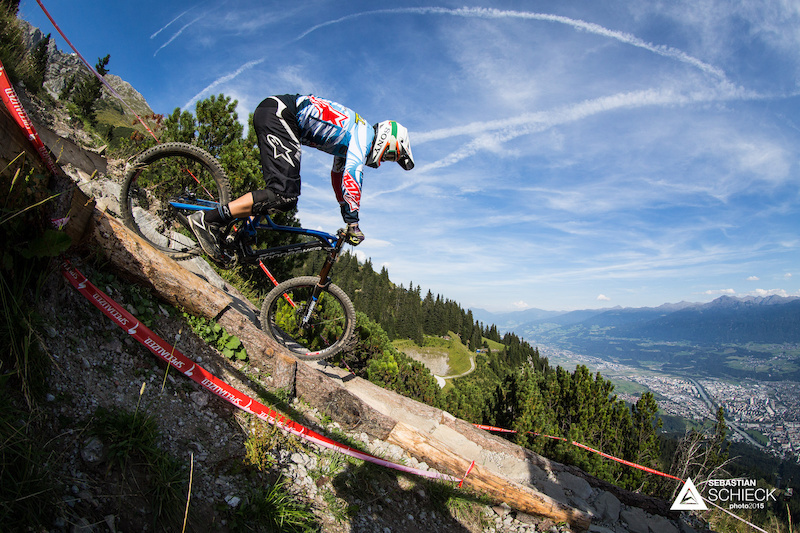 A race mixing Worldcup pros and locals on a long and brutal track. 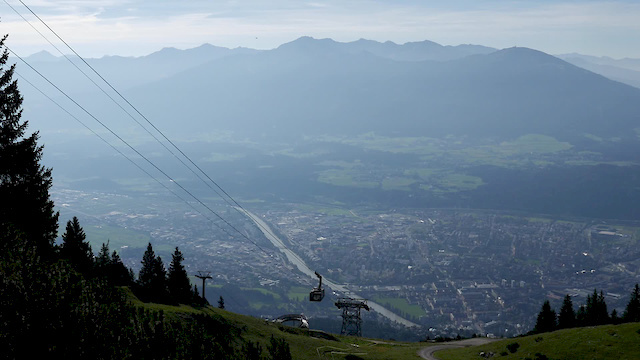 The Seegrube, set high above the city with some proper alpine setting behind it, is a small but technical skiing area in winter. 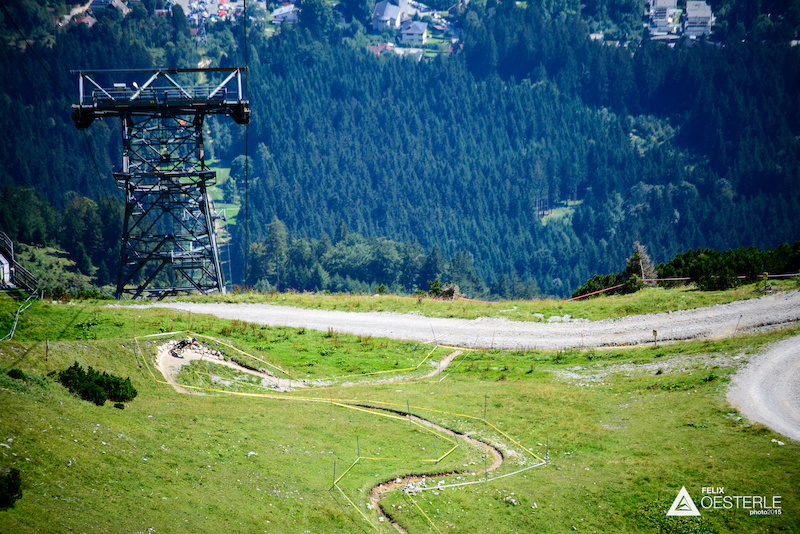 Destination for countless tourists in summer it also has one of the most demanding downhill tracks in Europe. 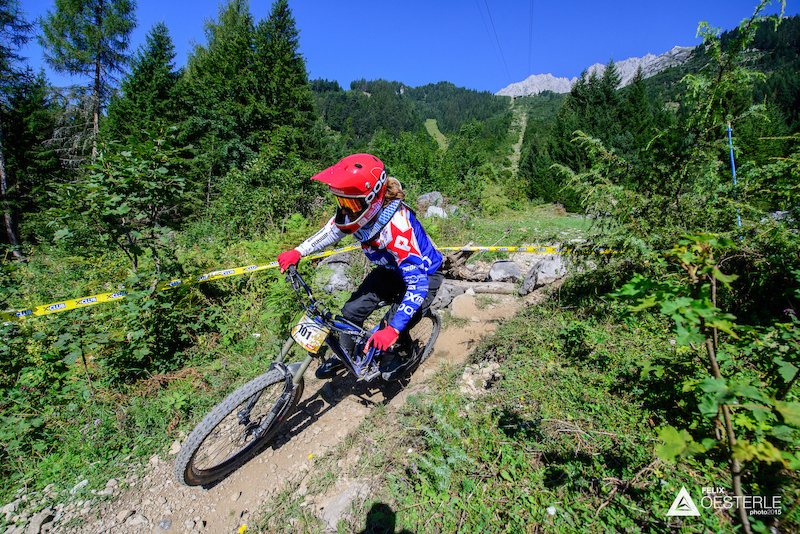 In addition to the Downhill.PRO race, the race run also counted for the Austrian Championships, trying to find the fastest Austrian racers in the categories women, men, juniors and U17. 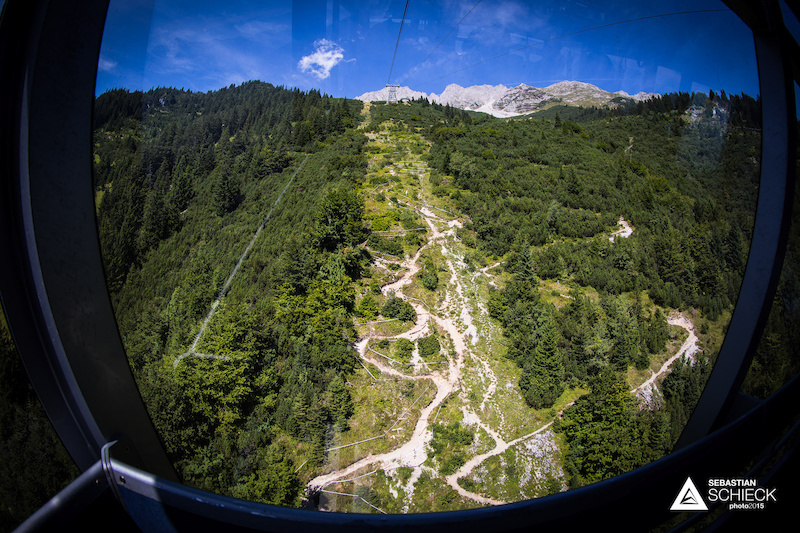 Running right below the cable car, the track can be inspected from above when taking the uplift to Seegrube. 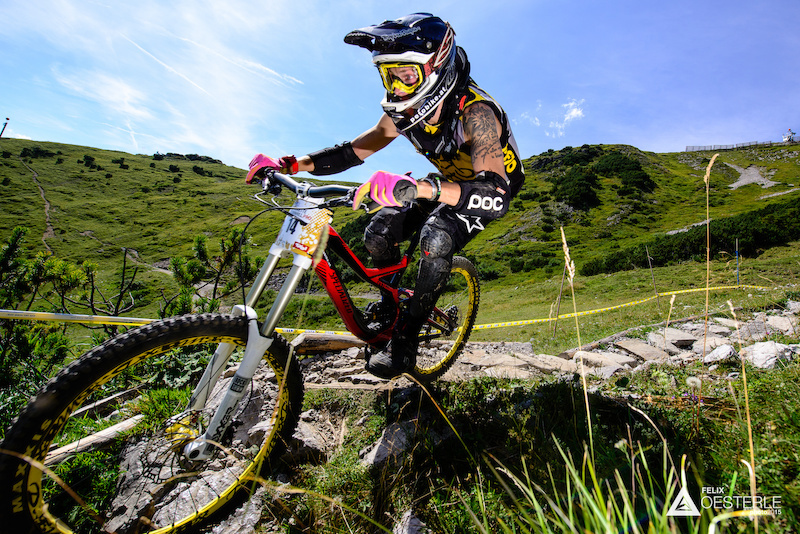 Usually many "aaaahhhhs" and "oooohh" can be heard from people not familiar with downhill biking. 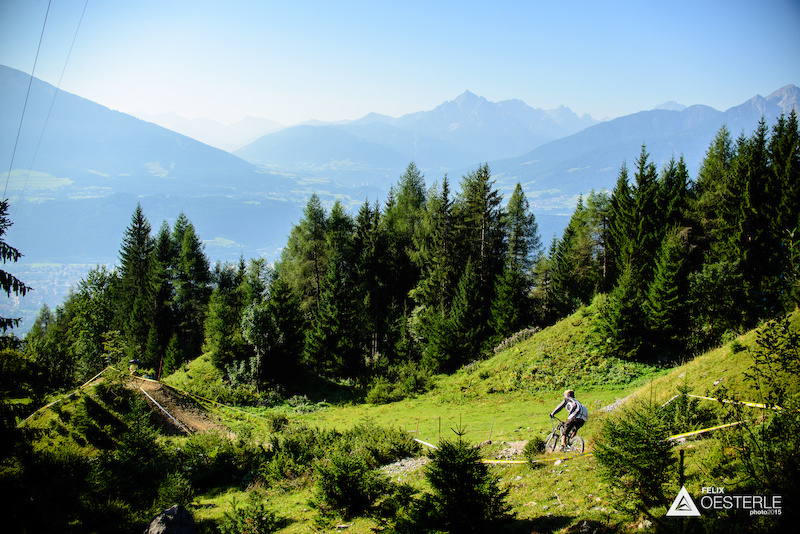 One question heard quite often is: "You ride your bike down this trail?!?!" 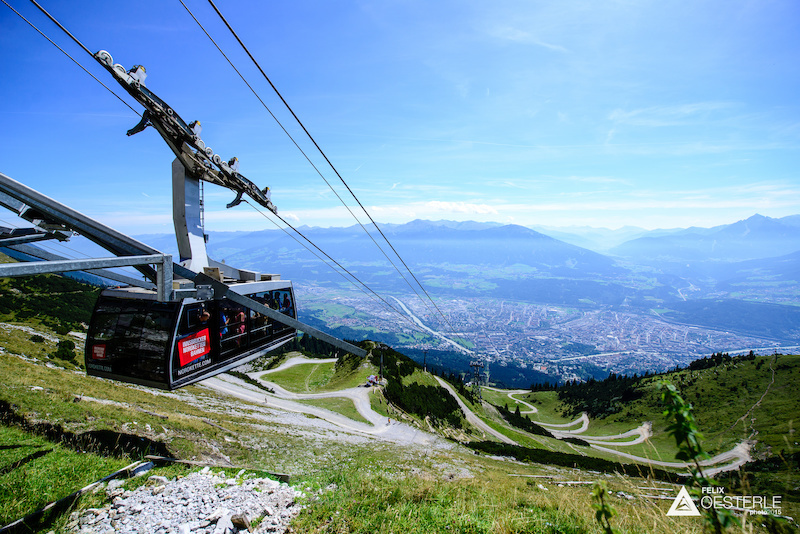 The start is just slightly lower than the upper station of the cable car, giving the riders a full kilometer (1030m) of vertical descent, always with a beautiful view across the Inn Valley. Mick HANNAH of Australia. 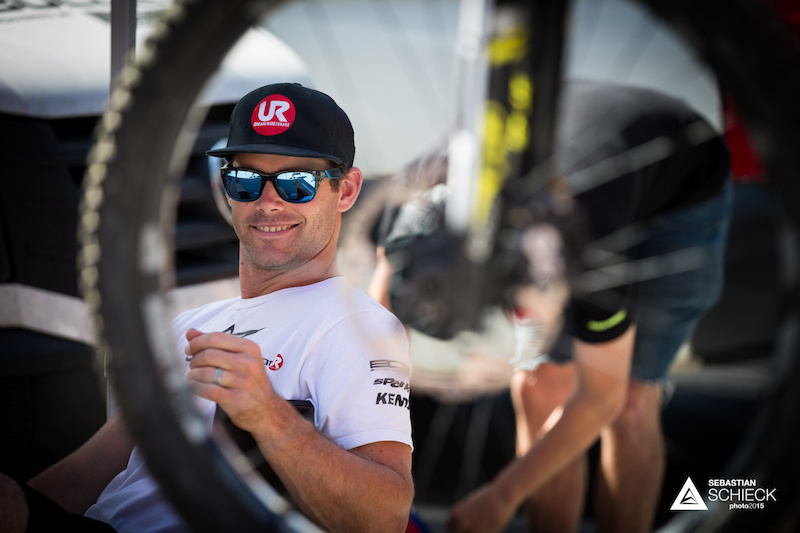 Thursday saw most of the riders checking the trail for the first time, but most of the time riders tried to stay in the shade due to the scorching hot temperatures. 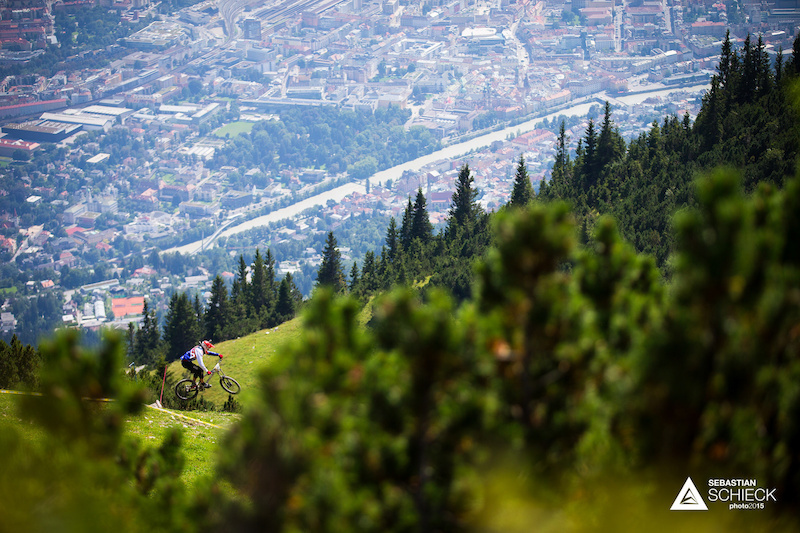 One of the marketing slogans of Innsbruck is "alpine to urban" which describes the Nordkette Singletrail just perfectly. Starting off with a ton of gnarly switchbacks, this trail is rather technical with not that many (read: basically zero) high speed sections. Conditions proved to be loose and dusty. 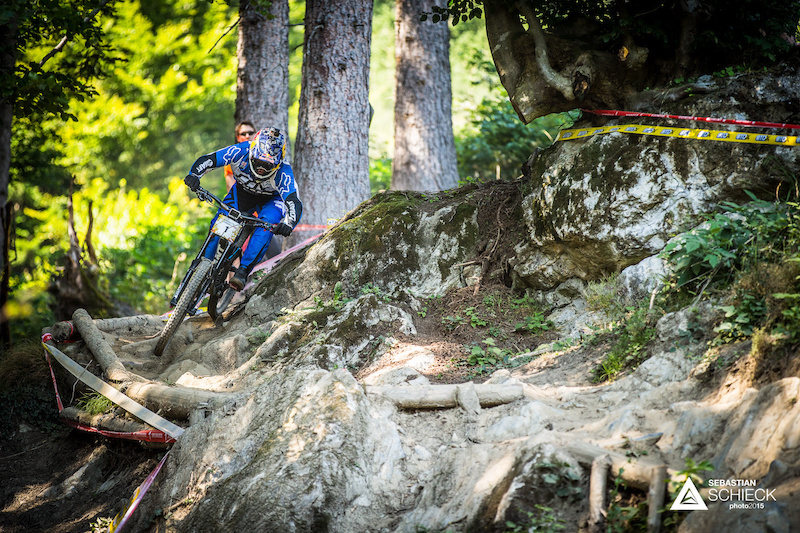 Manuel WIDMANN (AUT) makes the best out of it by racing through a smaller berm at the top of the track. 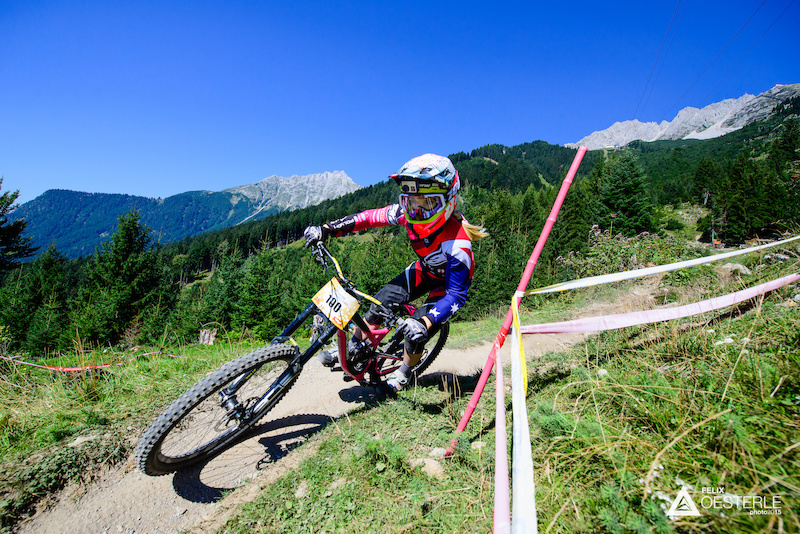 As women's Austrian champ Elke RABEDER (AUT) put it: the recipe for success is not to have any crashes. ENGEL Pascal (AUT) dropping into the 'stone ladder". In past years the track had tons and tons of loose gravel, but due to quite some effort from the trail crew, this was reduced considerably, making it a least a little bit easier. 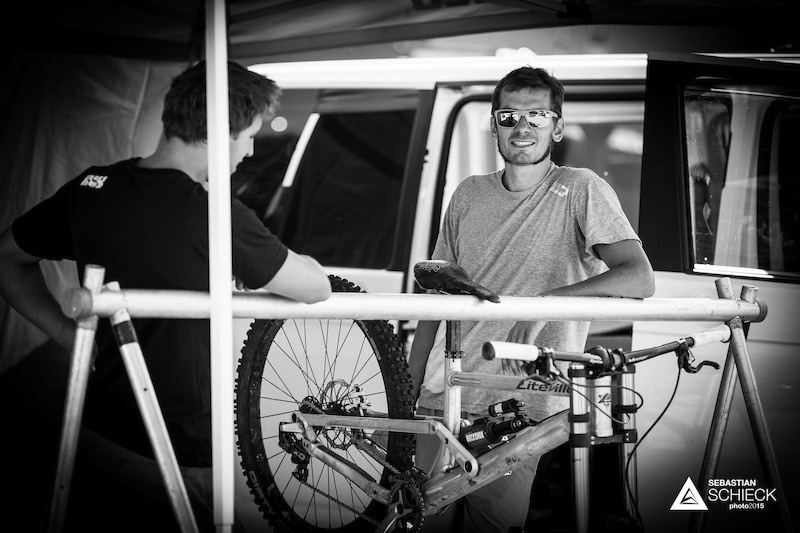 Local Benedikt PURNER is the one putting most hours into maintaining the trail. 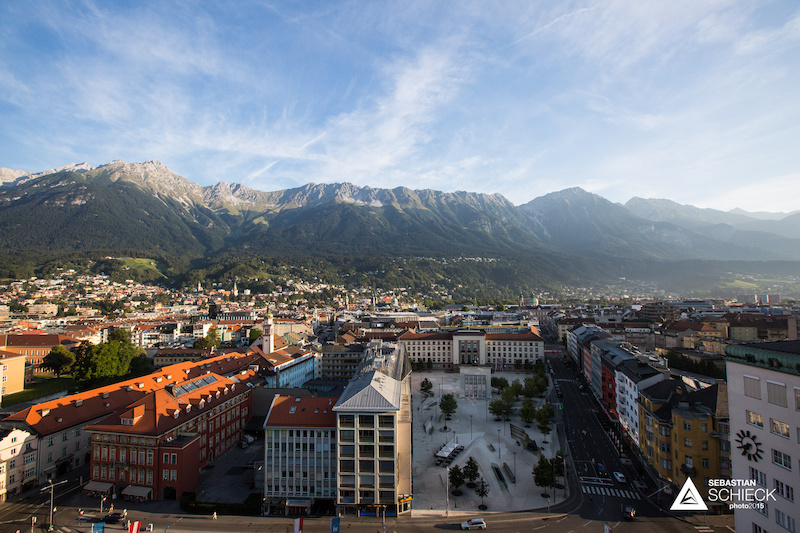 Most of the boulders you see in this pictures were laboriously brought in from other valleys around Innsbruck. If you got a tattoo you might as well show it. WUCHERER Robert (AUT) decided to go with a sleeveless shirt. The race officials didn't quite appreciate it, so on race day he had to follow the regulations and show up with a sleeved shirt. 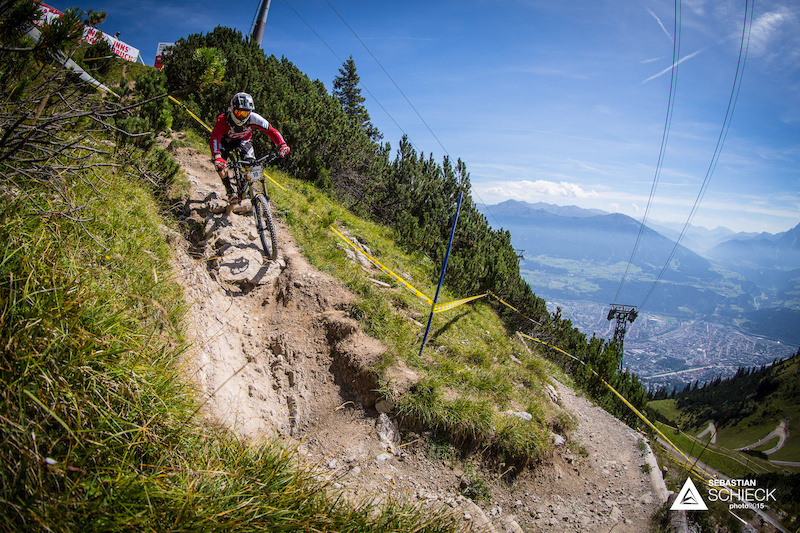 Bildbeschreibung: Filip POLC (SVK) one of the faster sections of the trail. Being ill the two weeks before the event didn't do any good to his riding. 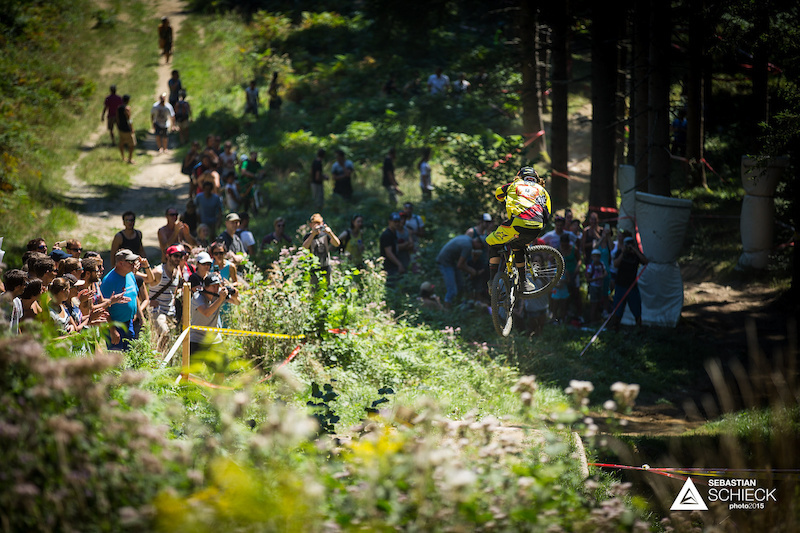 Being one of the crowd favorite's he still gave it his best, ending up in 14th place. 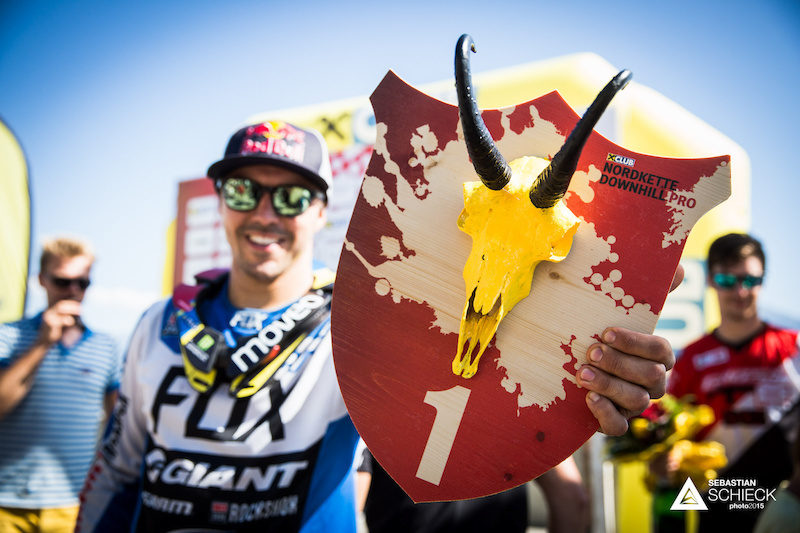 Last year's winner, Marcelo Gutierrez of Colombia, set out to repeat his success. 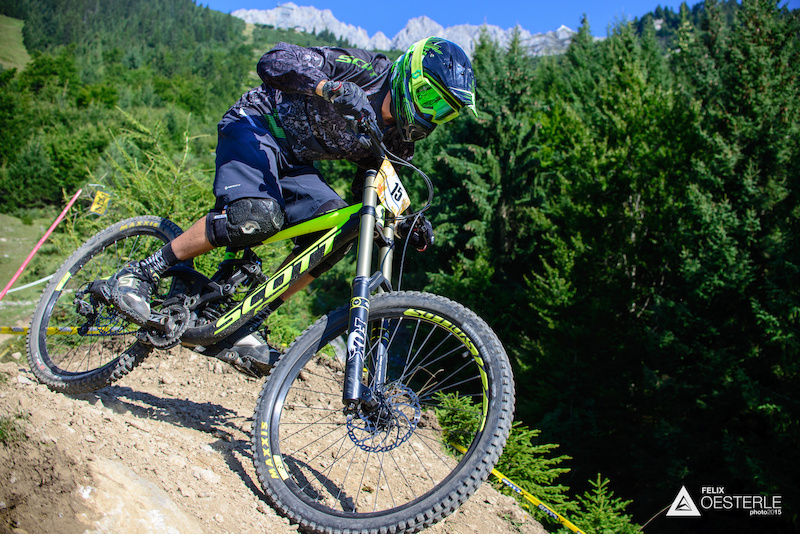 Being known for his physical fitness, as demonstrated with his win of the Whistler Garbanzo Downhill, put him right at the top of the list of favorites. 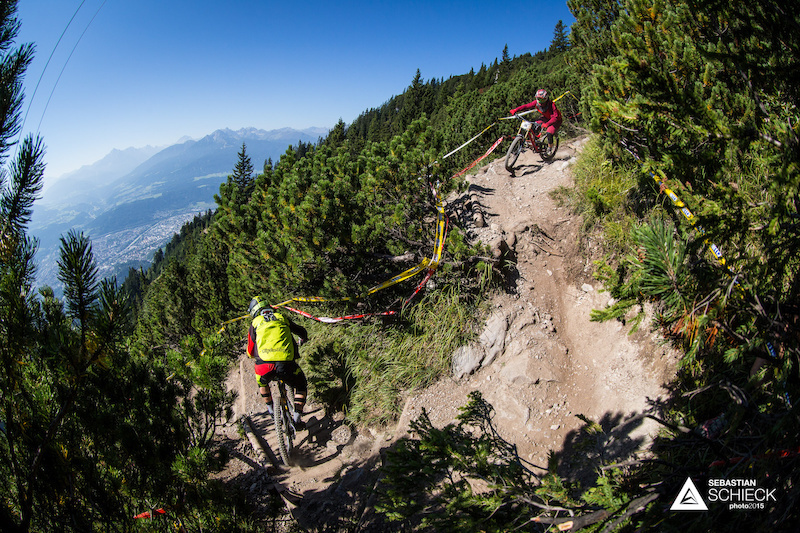 After a more "flowy" (or rather: as flowy as it gets) section, Mick Hanna and Andrew Neethling drop into the "3er-Stuetzen Alptraum", which translates to "Pillar nightmare". 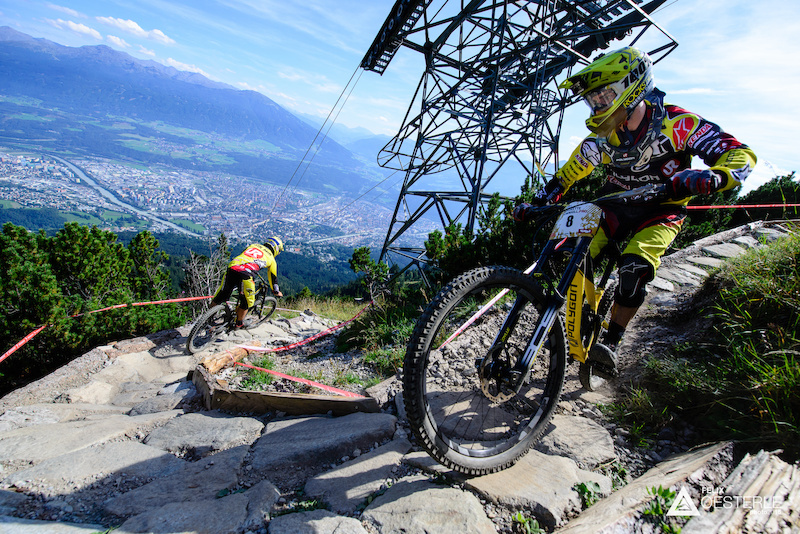 Step, technical, nasty tight turns combined with loose gravel and high steps. 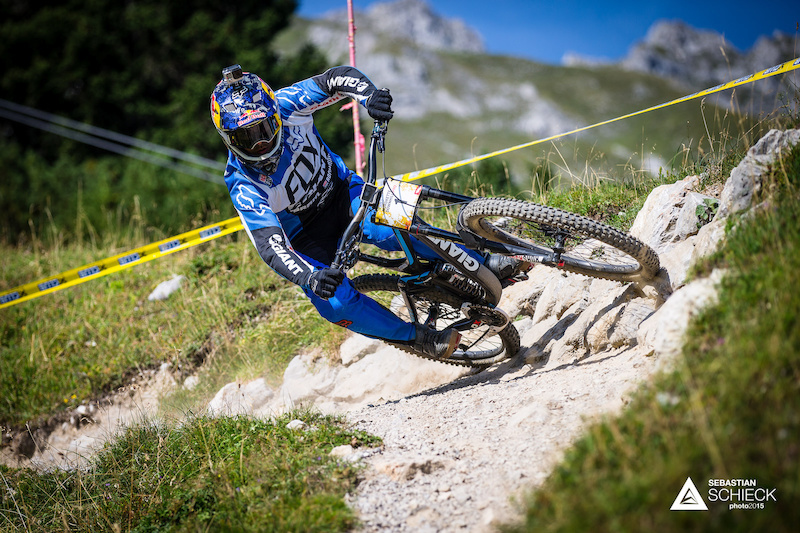 Last years Austrian champion and top scoring Austrian Worldcup rider Markus PEKOLL tried to defend his title. 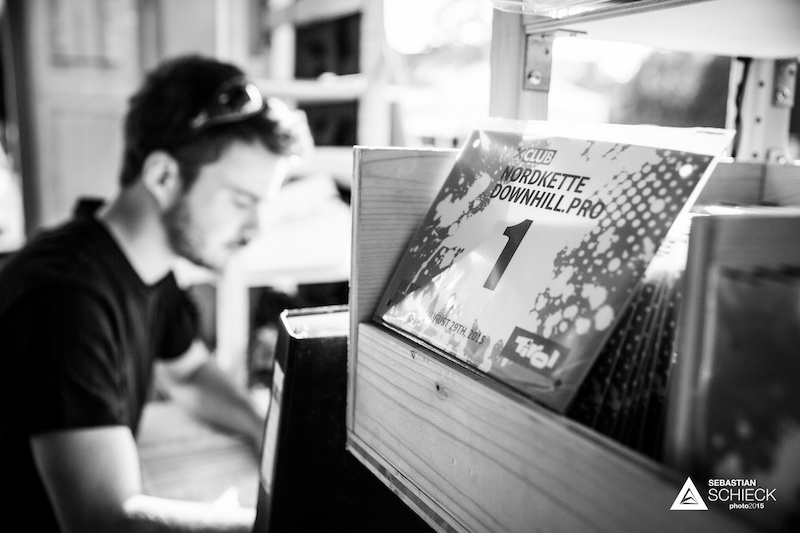 Admittedly not one of his favourite tracks, the Nordkette Singletrail made it hard for him. 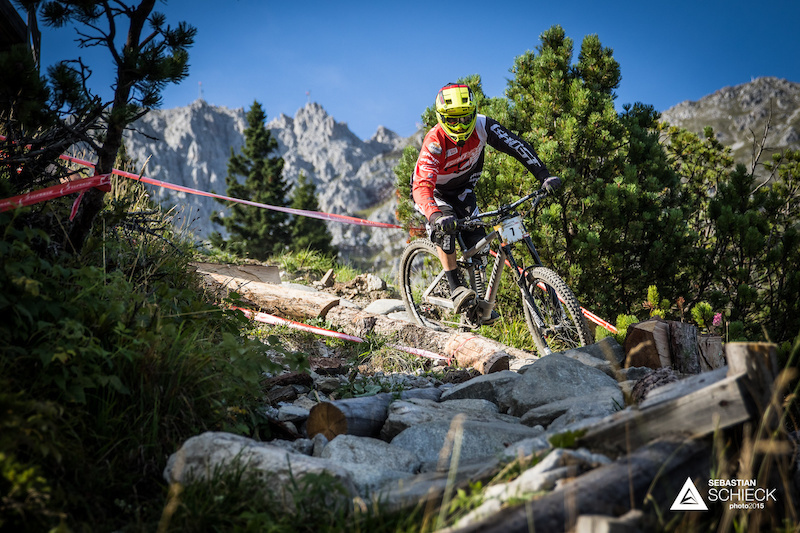 In the end he came 5th in the overall and second in the Austrian Championships. 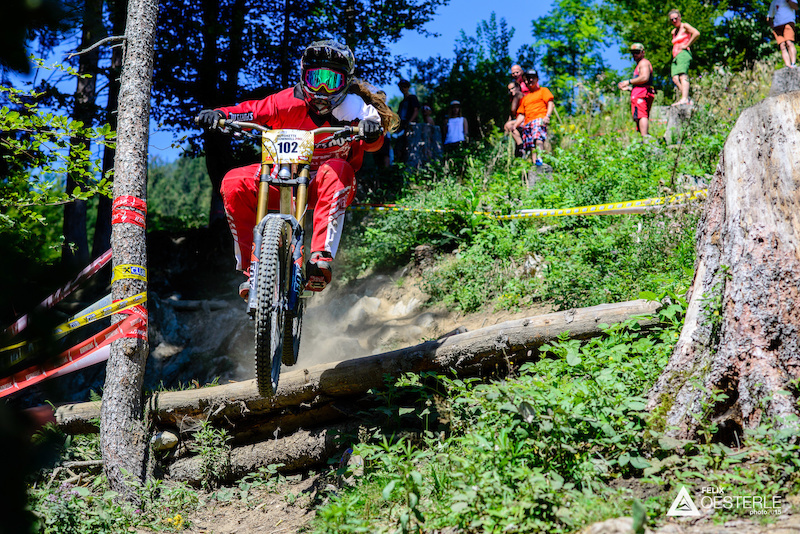 David TRUMMER was the fastest Austrian rider, coming in 3rd place in the overall ranking, but taking the Austrian championship from Markus PEKOLL. Still part of the "pillar nightmare" this section is without a doubt one of the hardest ones on this trail. At least there are enough mountain pines to catch you if something goes wrong. Wyn MASTERS shows how it's done and makes quick work out of it. 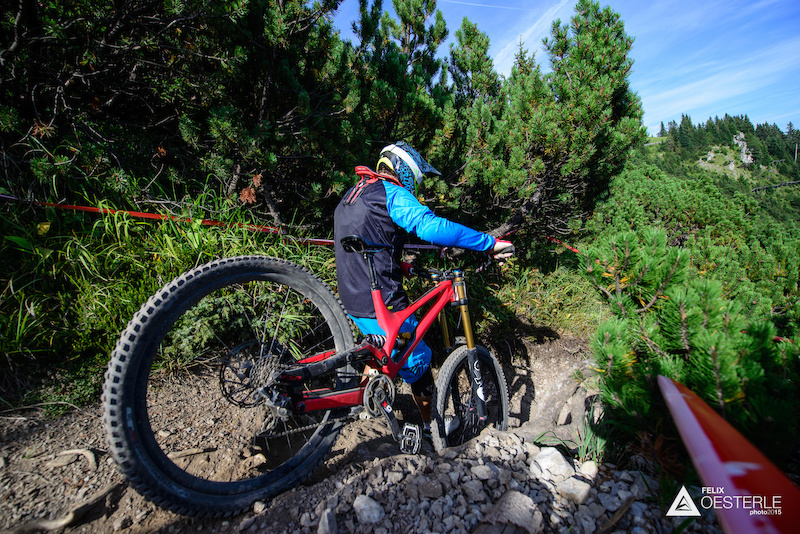 A combination of roots, steeps, small ladders and, by the end of the training, quite some loose gravel, meant the riders had to go all in or risk going over the handlebars. This is no fun: having about 750 vertical meters in front of you with a flat tire makes for some sore muscles. The women and U17 riders did start halfway down the trail, leading to a lot shorter race for them. 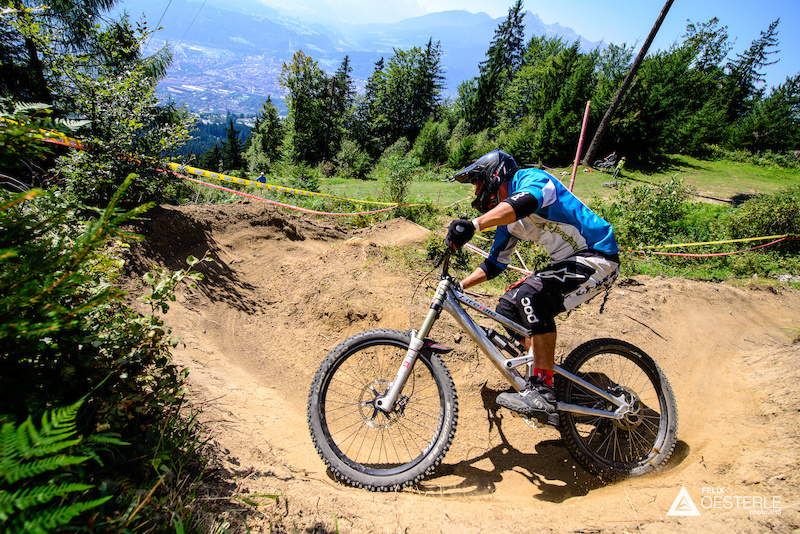 But make no mistake, even if this part is not as hard as the top part, it is still steep and technical enough to seriously test your skills. 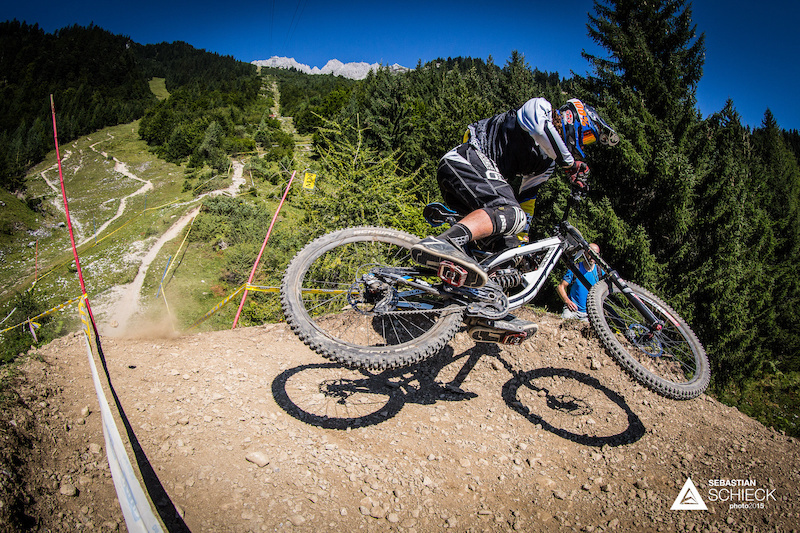 Plenty of berms to smash through. 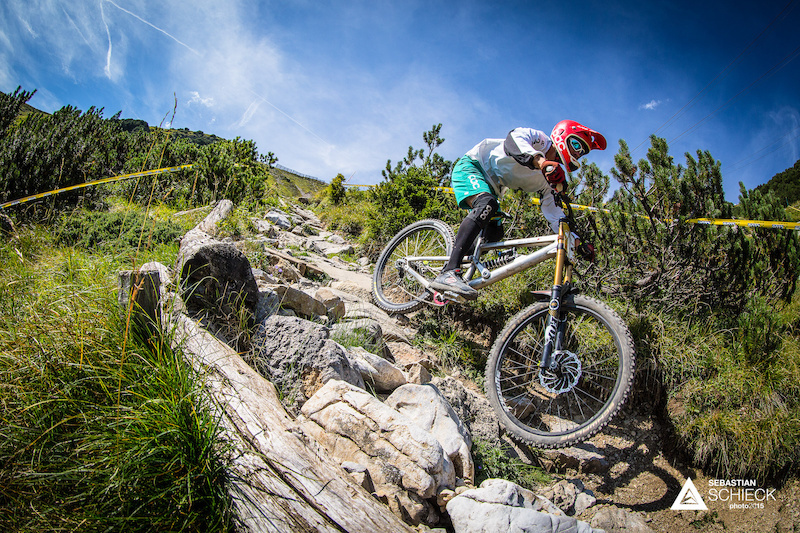 Local rider Gerhard SENFTER ended up 8th in the overall. Ask by the commentator whether he had crash he just answered: "mmh, at least I did not get separated from my bike..."
This man here is a local legend: Willi Hofer might not be the fastest (16th place overall) but he's definitely the one with the most stamina. He did 29 (!) runs in 12 hours down this track! This guy is seriously nuts. ... whereas Wyn MASTERS (NZL) puts in a serious scrub. Having had several second places on this track, Wyn put in quite a few training runs to hopefully take first this year. In the end he came nearly 20 seconds behind the winner into 2nd place. 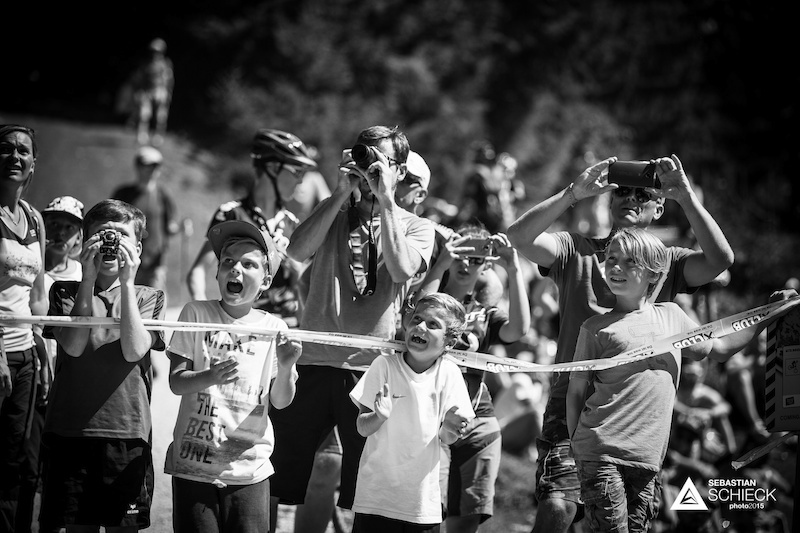 One of the crowds favorite spots: the road gap always attracts quite a few spectators. 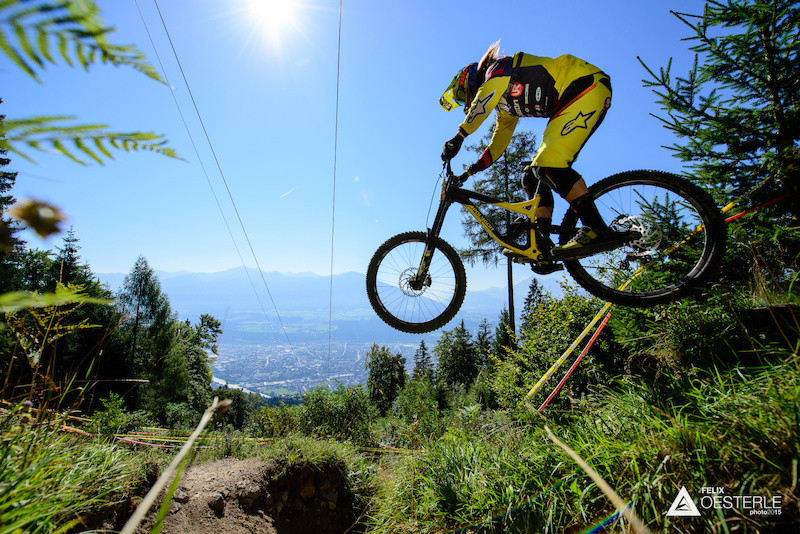 Here Christoph MATZKE (GER) shows how it's done. Tracey HANNAH (AUS) put down a solid run to win the women's category by a healthy margin of 20 seconds and a time of 4:59.75. 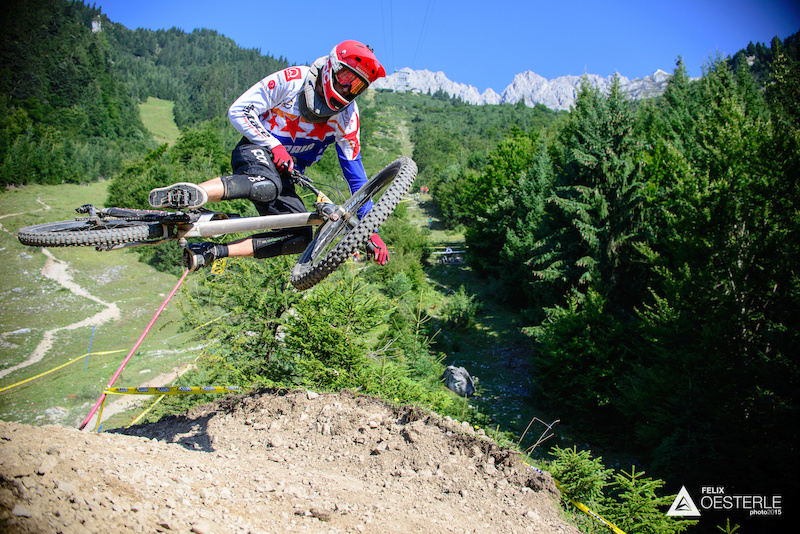 The lower part of the trail sees a lot more jumps and berms, here's Remy MORTON (AUS) enjoying a bit of air time. Tracey Hannah in one of the rock sections of the lower trail. RABEDER Elke (AUT) knows this track quite well and once again took the national title in the women's category and came in 2nd overall. Boris TETZLAF through one on the dusty and loose berms of the lower part. 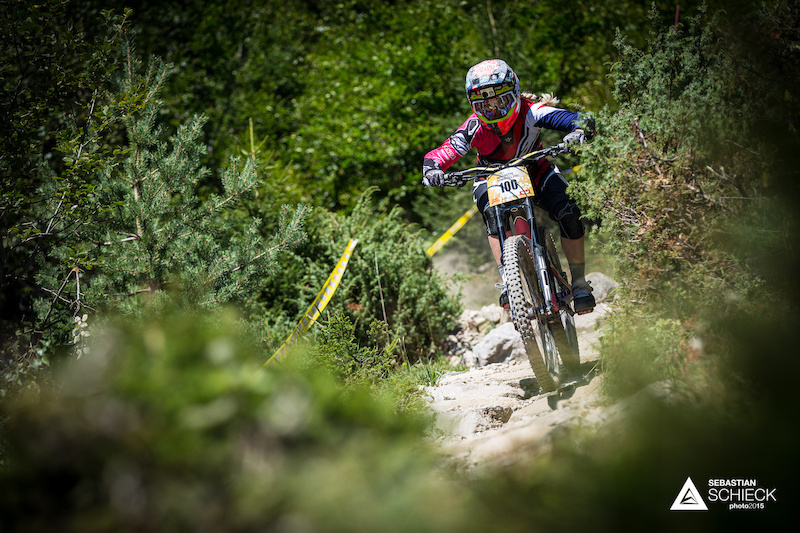 Even if the lower part is a bit easier it proved a challenge for many riders. 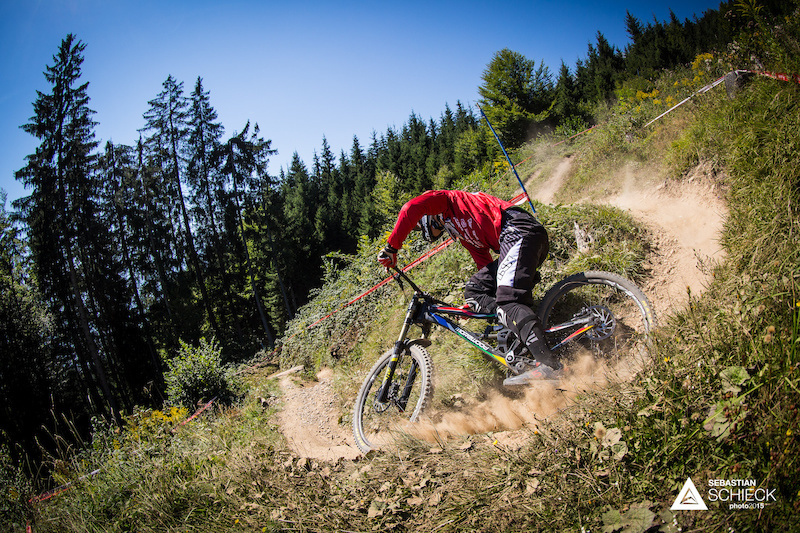 After having ridden 800 vertical meters, most riders held onto their handles with pumped arms. Marcelo GUTIERREZ (COL) lived up to his number plate and repeated his win. With a time of 9:45.88 (and a 20 s margin on Wyn) he went outside Sam Hill's record time of 9:21. But with the track having changed completely the time looks more and more out of track. Another spectators favorite spot, the "Red Corner" saw quite some action. 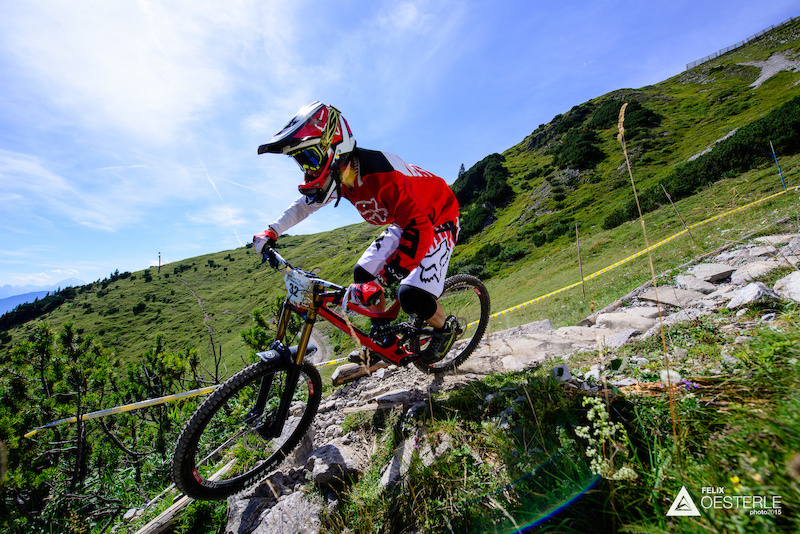 Simone WECHSELBERGER (AUT) hoped to put down a seriously fast time with her local knowledge, but a minor injury in training didn't exactly help. Nevertheless she took third in the women's class. The heat saw quite a lot umbrellas being carried around, riders were completely drenched at the finish. Here's RIBARICH Lisa (AUT) getting close to the end. Whoever didn't have an umbrella and couldn't stand the heat, went on to try to find a spot under some trees. Here's Remy MORTON (AUS) showing how to properly jump the "sender". 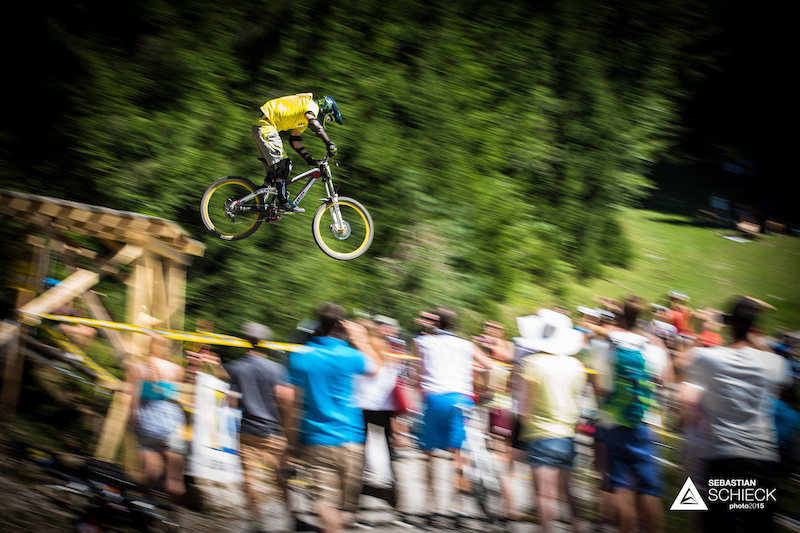 One last jump into the finish area concludes the race. 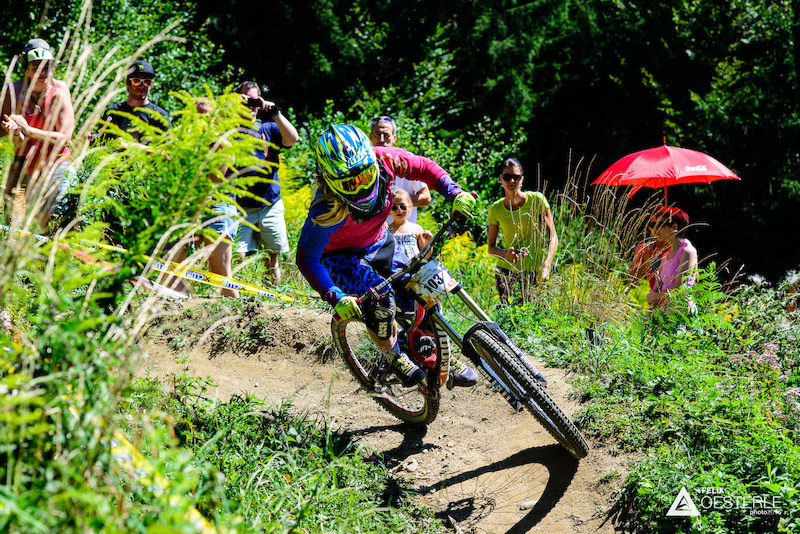 Those with a few crashes usually styled it, but the ones still in for the win tried to stay low. Having had a few hiccups in his run, Remy MORTON goes high and wide. 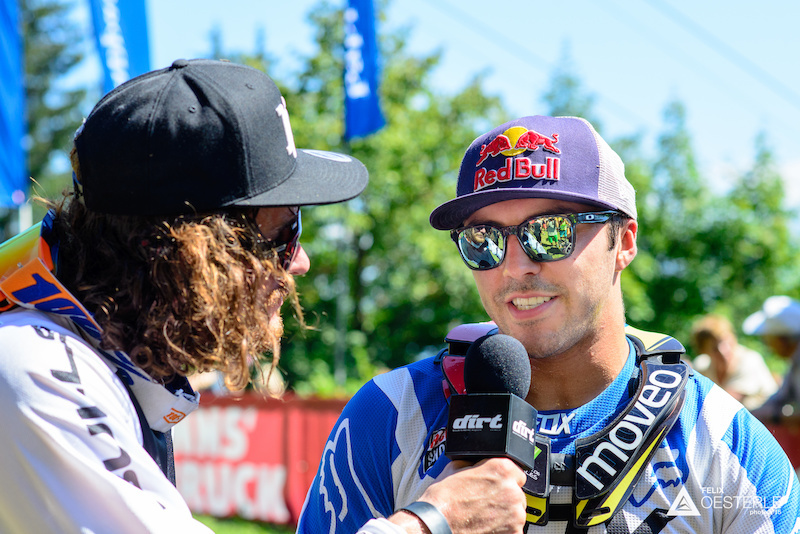 When's the last time you saw a 2nd place racer interview the winner?! What out for WynTV's edit of the race. Marcelo happy it worked out again. Innsbruck's Tom OEHLER pleasing the crowd right before the price giving ceremony. 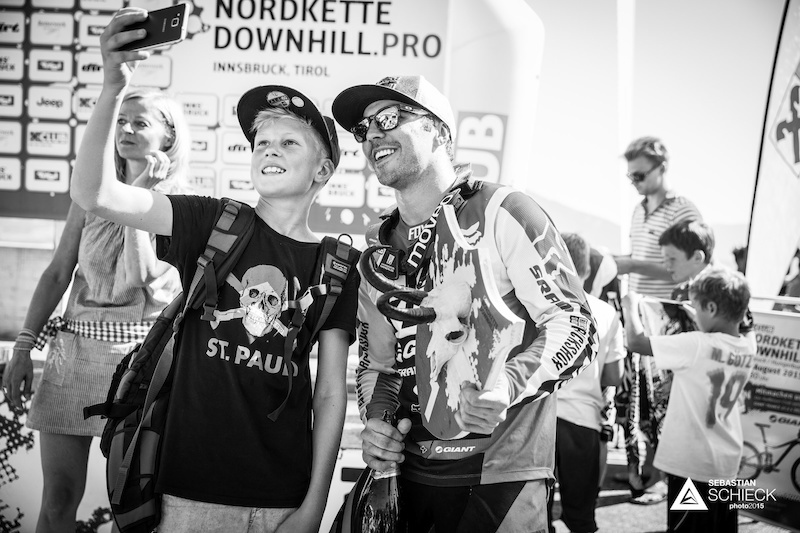 Selfies with the winner are the new autographs. Always one to please his fans, Marcelo had to handle quite a few requests. And one last tidbit of local knowledge: these antlers are called "Krickerl". Try to say this without hurting your voice cords. Hope you enjoyed the story, see you next time. Marcelo has everything it takes to rule the downhill WC over the coming years but one thing: being convinced of this. It seems unbelievable this guy got as far as he has, above all coming from where he does. He's not blonde, his last name is not Smith or McSomeone, speaks English with South American accent, and people in his country don't know what the f*ck is a shock. We all know that against this background you gotta be really really good to make a room for yourself in this circle. Just look at the number of mediocre WASP racers in the photos. not only racing, much better for business a guy named Amstrong wins races, even though he does being high, right? Wyn for the win!!! Nice trials too.